Fassinating Fassbender - A Michael Fassbender Fan Blog: It was only $3.95! I went to Barnes and Noble yesterday looking for a few books that I saw on the clearance area a couple weeks back. A recipe book on Smoothies (I bought a Cuisinart smoothie machine on Sunday), and a learn French on the go book & CDs (yes, preparing for Paris next June). Both were there and I picked them up. 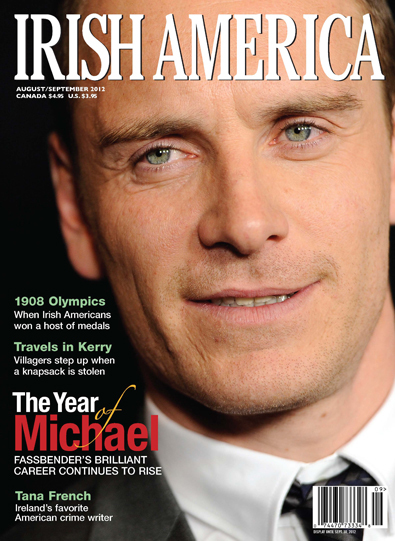 But I also browsed the magazine stand and this store finally got the August/September issue of Irish America with Michael Fassbender on the cover. I looked at it and recalled the corny interview, but... the cover is so lovely, and plus, since I visited Ireland this year, there were some nice articles in there that I wanted to read, so, I bought it. Like someone else mentioned a while back in reference to the W issue with Charlize and Michael on the cover, she buys all magazines with Michael on the cover. I agree with that and that's what I have been doing, so although I passed on the W issue because I really didn't like it at all, I am happy to add the Irish America magazine to my growing Library of Fassbender. So, if you happen to find it on your newsstand, go ahead and grab it. If you are having difficulties procuring a copy, let me know and I can grab one for you. Salut Simone! Pour bien préparer ton voyage à Paris, tu peux t'inspirer du formidable accent français de Michael dans X Men! Wow, it's fun to write in one's own language! LOL! I'm confident London/Paris will happen. I was studying yesterday and my mind started to drift off about Paris. Then I glanced through the small pile of mail that I hadn't gone through and the first bit of mail that I blindly grabbed was an advert from my airline company (Delta) about planning a future trip and if I enrolled in their credit card program I would get 40,000 frequent flyer miles - and guess which iconic image they used on the front of the envelope? I'm soooooooooo there! It was a SIGN!